In March, when I came home from Korea, my husband and I went on vacation through Oregon. Half of the places we went we were cooking Korean food, but we reconnected with my friend Niina from my first two years of college, who had just gotten home from a mission trip to Thailand. She made one of her favorite Thai dishes and I LOVED IT! Now when I heard what was in this dish, I was afraid to try it. I have never had a curry I liked, nor do I enjoy pumpkin, both of which are in this recipe. I was really worried, but wanted to be polite so I tried it. I have wanted to make it since, but have always been worried about the cost and finding all of the ingredients. 🙂 I was right to be worried in Boise, Idaho, but I was able to play with the recipe a little and get a pretty good result. My one substitute to Niina’s Recipe was that I could not find the curry paste. I used a pre-assembled panang sauce rather than panang paste, because it was all I could find. This is what I used. I did add everything else in the recipe and it turned out amazing. I will admit, I am going to be lazy and just copy and paste from Niina’s page now that I have added my substitute and her information. I added this to jasmine rice. and it was awesome! 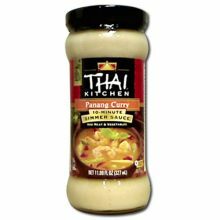 Blend curry paste and peanut oil together in wok until smooth and creamy. Slowly add coconut milk until paste turns into a thick soup. 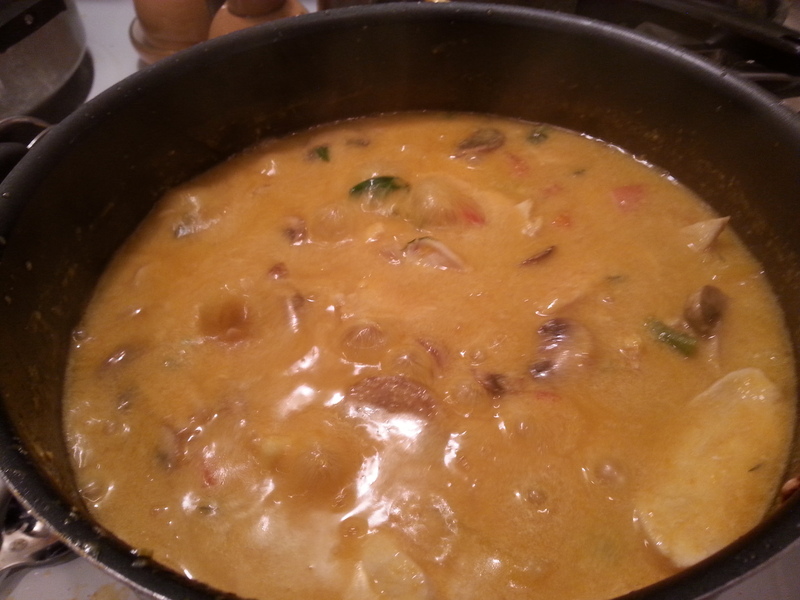 Add onions, garlic and a handful of pumpkin cubes (it will dissolve into the curry paste) and turn stove on low heat. Use cooking scissors to cut chicken fillets thinly into the wok. Cook until chicken turns white. Add basil leaves, sliced red and yellow peppers, cubed pumpkin, zucchini, asparagus and sliced mushrooms into the wok. Mix together and let curry simmer (stir occasionally) until the pumpkin cubes are soft (at least 30 minutes). 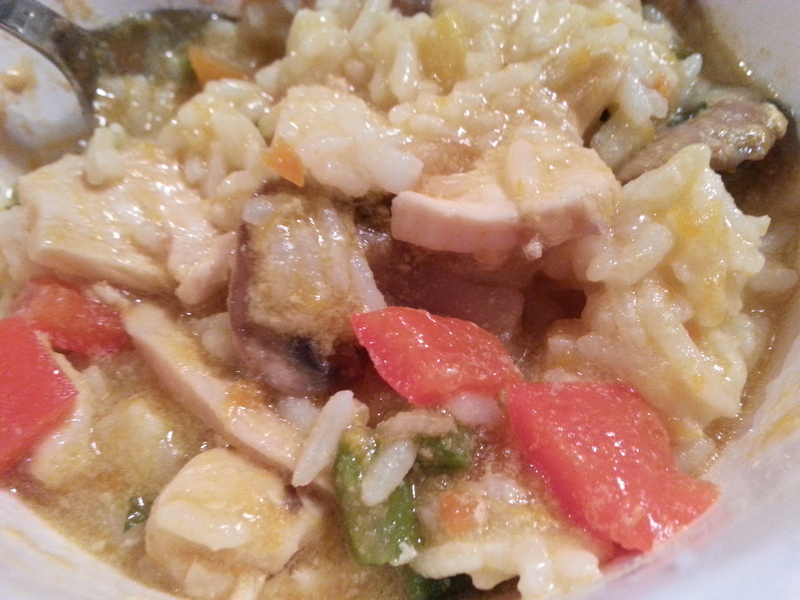 Serve with Thai Jasmine Rice. What I noticed was that my pumpkin was not really breaking down. I actually took a potato masher and mashed them up a bit once they were really soft. Maybe I did not cook it long enough, but I cooked for a total of two hours, and I needed to eat. Once did that, I cooked the chicken and added the veggies. I cut the pumpkin in much smaller chunks when I added the other veggies, so it would cook faster. Thank you Niina for changing my mind on both curry and pumpkin! I love this stuff, and will be making it again! I have more of the sauce and half a pumpkin that is going into the freezer for next time! Yummmmmmmy!!!!!! !